The housing industry has helped stabilize the economy thanks to demand for products and services from Armstrong World, Lennox, Masco, Owens Corning and Vulcan Materials. Armstrong World (AWI - Get Report) , Lennox International (LII - Get Report) , Masco (MAS - Get Report) , Owens Corning (OC - Get Report) and Vulcan Materials (VMC - Get Report) provide products and materials to all segments of the housing market, including new home construction and home resales. Here's how to trade them. These five stocks are components of the PHLX Housing Index, which has 19 components of which 11 are homebuilders. Armstrong World provides flooring, ceilings and cabinets. Lennox provides air conditioning and heating systems. Masco provides home improvement and building products. Owens Corning makes insulation, roofing and siding products. Vulcan Materials makes the ingredients for concrete and cement. The weekly chart for the housing index ended last week negative with the index below is key weekly moving average of 230.90 and above its 200-week simple moving average of 203.53, last tested from lower levels between the end of January and mid-February when the index traded as low as 184.50. Weekly momentum is projected to decline to 65.48 this week down from 74.68 on June 17. 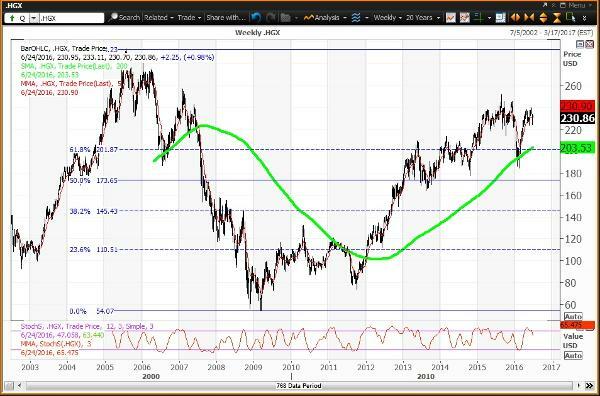 The horizontal lines are the Fibonacci Retracements of the decline from its July 2005 high of 293.66 to the March 2009 low 54.31. The crash of 2008 totaled 81.5%. The index has been above its 61.8% retracement at 201.87 since the week of Feb. 26. 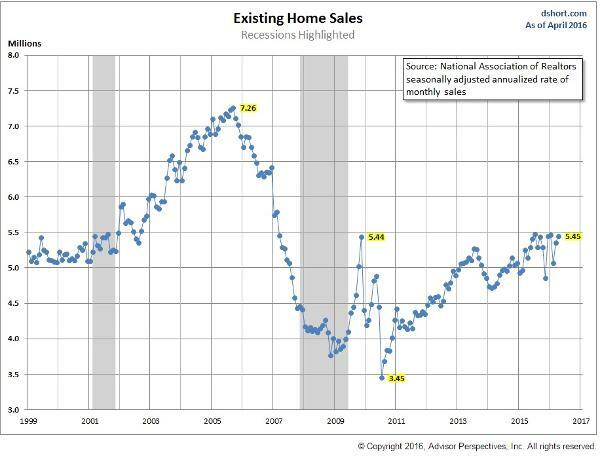 Here's a chart for existing home sales going back to 1999. During the Great Credit Crunch that began in 2008 home resales bottomed at an annual rate of about 3.75 million. There was a quick rebound in 2009 to 5.44 billion before crashing to a millennium low of 3.45 million in early-2010. Note how a steady improvement stalled below 5.50 million about a year ago. In April 2016 the reading was 5.45 million making the 5.50 million sales threshold a ceiling for more than seven years, which is about 60% of potential. 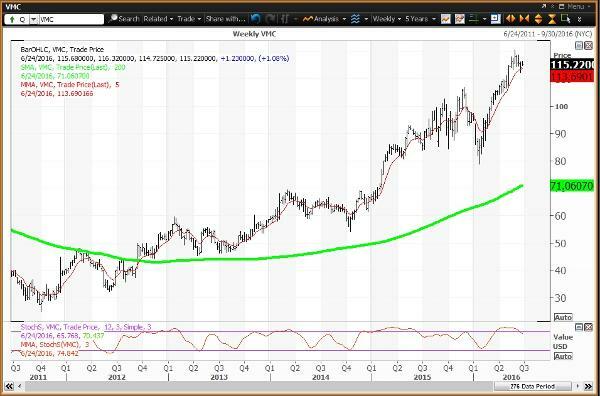 The weekly chart for Armstrong World is negative with the stock below its key weekly moving average of $40.45. 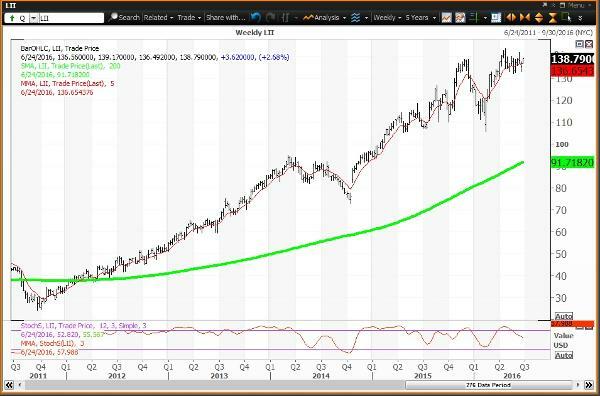 This stock has been below its 200-week simple moving average of $44.87 since the week of Sept. 25, 2015. The weekly momentum reading is projected to decline to 52.93 this week down from 64.01 on June 17. Investors looking to buy Armstrong should buy weakness to $39.07 and $38.57. which are key levels on technical charts until the end of this week and the end of June, respectively. 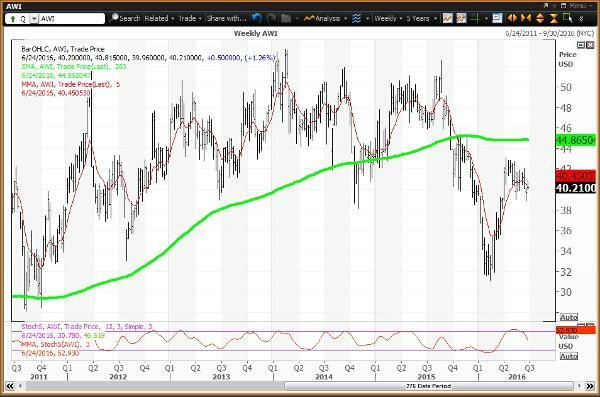 Investors looking to reduce holdings should sell strength to $41.95, $43.50 and $47.94, which are key levels on technical charts until the end of 2016 and the end of June for the final two. 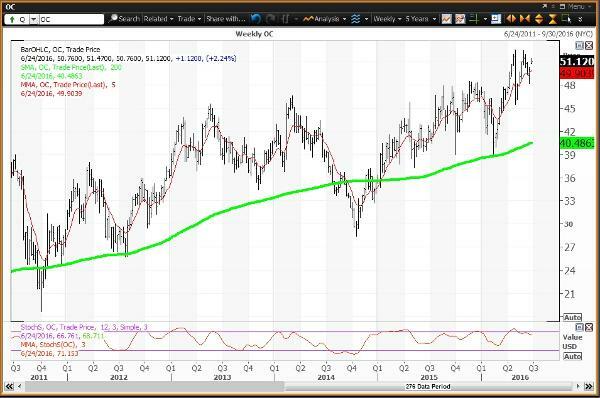 The weekly chart for Lennox ended last week negative, but will be neutral if the stock ends the week above its key weekly moving average of $136.65. This stock is well above its 200-week simple moving average of $91.72 and has been above this average since the week of April 20, 2012 when the average was $39.05. The weekly momentum reading is projected to decline to 57.99 this week down from 60.57 on June 17. Investors looking to buy Lennox should buy weakness to $134.78, $128.98 and $99.65, which are key levels on technical charts until the end of this week, until the end of June and the end of 2016, respectively. Investors looking to reduce holdings should sell strength to $148.65, which is a key level on technical charts until the end of June. The weekly chart for Masco ended last week negative, but will be neutral if the stock ends the week above its key weekly moving average of $31.38. This stock is well above its 200-week simple moving average of $21.37 and has been above this average since the week of Aug. 3, 2012 when the average was $10.31. The weekly momentum reading is projected to decline to 57.95 this week down from 67.37 on June 17. Investors looking to buy Masco should buy weakness to $30.70, which is a key level on technical charts until the end of June. Investors looking to reduce holdings should sell strength to $33.10, which is a key level on technical charts until the end of June. 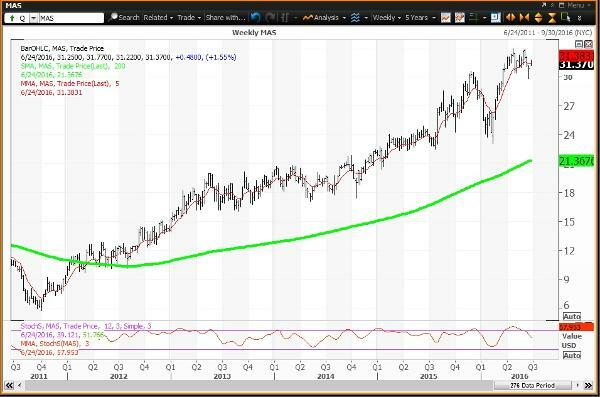 The weekly chart for Owens Corning ended last week neutral with the stock above its key weekly moving average of $49.90. This stock is above its 200-week simple moving average of $40.49 and has been above this average since the week of Jan. 9, 2015 when the average was $35.57. The weekly momentum reading is projected to decline to 71.15 this week down from 73.35 on June 17. Investors looking to buy Owens Corning should buy weakness to $48.76 and $45.23, which are key levels on technical charts until the end of 2016 and the end of June, respectively. Investors looking to reduce holdings should sell strength to $52.31, which is a key level on technical charts until the end of June. The weekly chart for Vulcan Materials ended last week neutral with the stock above its key weekly moving average of $113.69. This stock is well above its 200-week simple moving average of $71.06 and has been above this average since the week of Sept. 14, 2012 when the average was $43.60. The weekly momentum reading is projected to decline to 74.84 this week down from 79.38 on June 17. Investors looking to buy Vulcan Materials should buy weakness to $104.41 and $100.94, which are key levels on technical charts until the end of June. Investors looking to reduce holdings should sell strength to $116.94 and $120.16, which is a key level on technical charts until the end of June and the end of this week, respectively.